Choosing my top five favourite road tests for 2015 is no easy task, but since I’ve been asked to come up with a shortlist, here are my picks. The McLaren 650S and the Porsche 911 Carrera and Carrera S could have made the cut, much like the Mazda CX-3, but they didn’t. Here are my top five in order of preference. This icon was completely revamped in 2015. The fourth-generation Mazda MX-5 preserves its Miata heritage while pushing the limits of the future of roadsters. I demoed this featherweight sports car last January in Barcelona, Spain. They let me drive one of the few new MX-5 prototypes, a right-hand-driver powered by a 1.5-litre four-cylinder engine. 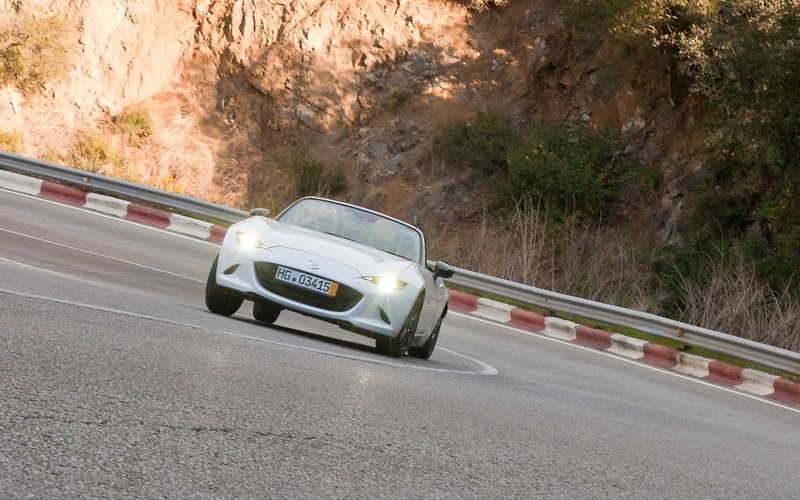 Blazing down the mountain roads of Catalonia was pure bliss and gave me the chance to confirm that the MX-5’s handling is both direct and inspired. The experience also proved that you don’t need to risk your driver’s license to have fun driving this car. My review ended with this: “It’s mission accomplished for Mazda and the excellent MX-5. On the open road, you’ll be struck by the conviction that there is at least one nearly perfect thing in this world, and that thing is the new MX-5.” My first impressions were confirmed when I tested the production model equipped with a 2.0-litre mill. In the end, the Car Guide team chose the MX-5 as Best New Car of the Year. Two days before the Tokyo Motor Show, I visited the Honda R&D centre in Tochigi, Japan and tested two pre-production models of the Acura NSX. This involved two brief but intense laps on their track in this highly anticipated exotic car. A true technical masterpiece, the Acura NSX unleashes the power of 573 horses with a drivetrain that includes a 3.5-litre twin-turbo V6 (developed exclusively for this model) and three electric motors. Flat-out acceleration proved just how fast this machine can move, despite the fact that it weighs in at 1,725 kg. And yet, its handling wasn’t as lively as I had hoped. My article concluded with: “In short, the connection between the driver and the NSX is a cerebral one, not a visceral one. And that makes sense these days, as efficiency trumps all. There’s no question that the NSX is fast, even fierce, but I’m still waiting for that spark to kindle my passion.” I’m looking forward to getting behind the wheel of the production NSX for a more comprehensive test. Maybe that will be enough to change my mind. Just a few laps at the Autodromo Internacional do Algarve near Faro, Portugal, were enough to convince me that the new Audi R8 V10 Plus was going to shake up the established order among exotics. It features a 5.2-litre, naturally aspirated V10 with 602 ponies to its name, as well as an aluminum and carbon-fibre hybrid frame. This means the R8 V10 is lighter, more powerful and more intense. On the Portimao track, this vehicle got my heart pumping and the overall experience put it, more than ever, in the exotic car league—which makes sense when you consider that it was developed in tandem with the R8 LMS race car. Add to that the vehicle’s unique appearance and a cabin that’s both welcoming and functional, and you’ve got joy on wheels. It used to be that the Mustang Shelby was only fast driving down straights. But Ford has totally transformed the Shelby GT350 and GT350R, which are now noticeably more dynamic than their predecessors. My first test drive of these models took place on one of my favourite playing fields, the Laguna Seca track in California, which is an uncompromising pass for any vehicle whose handling isn’t finely tuned. The GT350 proved at ease on the track, while the GT350R allowed me to brake a little later and take corners a little faster, both entering and exiting. In short, the GT350R is just like the GT350, only one serious notch better. OK, since we’re on the subject of playing fields, I have to add my experiences in the first two events of the Micra Cup on the Mont-Tremblant tack as part of my top five for 2015. Reconnecting with racing, seeing all the drivers, officials and volunteers that’s I’ve known for so long—not to mention discovering this new monotype series—was just plain awesome. I earned a seventh-place finish in the second race driving a Micra prepared by Éric Côté and the GT Racing team. This was definitely one of the highlights of 2015 for me.